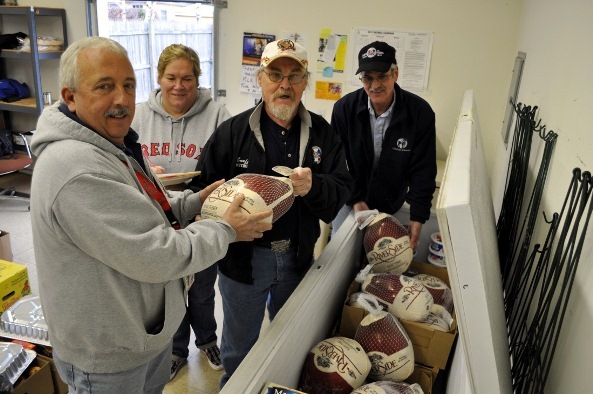 Left to right, IAM Local Lodge 1871 President Pat Buzzee, wife Julia Buzzee, Retiree and past Local 1871 President Michael “Snuffy” Smith, and Local 1871 Vice President Jim Underhill inventory turkeys for the 23rd Annual Thanksgiving Dinner Drive at the Local 1871 Food Pantry. IAM Local 1871 in Groton, CT, completed its 23rd year of providing Thanksgiving baskets for out-of-work members and needy families in the community, and, in what has also become a tradition, they broke last years record. Volunteers distributed dinner to more than 90 families. 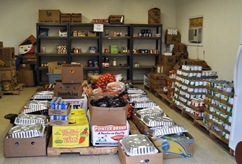 Thanksgiving dinner baskets await distribution at the IAM Local 1871 Food Pantry in Groton, CT. The baskets included completed Thanksgiving dinners and were supplied at no cost to working families that might not otherwise enjoy a traditional holiday dinner in the current economy. IAM members and others working at Electric Boat in Groton, as well as other union members including the Metal Trades Council and Marine Draftsmen’s Association/United Autoworkers make the baskets possible through donations. The effort has grown to also include many community businesses.